The Lewis concept of acids and bases is discussed in every general, organic and inorganic chemistry textbook. This is usually just a descriptive treatment, as it is not possible to devise a single numerical scale suitable for all occasions. However quantitative Lewis acid-base chemistry can be developed by compiling reaction-specific basicity scales which can be used in specific branches of chemistry and biochemistry. 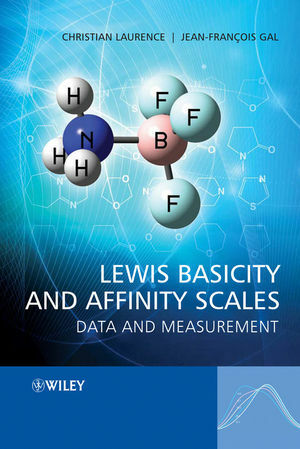 Lewis Basicity and Affinity Scales: Data and Measurementbrings together for the first time a comprehensive range of Lewis basicity/affinity data in one volume. More than 2400 equilibrium constants of acid-base reactions, 1500 complexation enthalpies, and nearly 2000 infrared and ultraviolet shifts upon complexation are gathered together in 25 thermodynamic and spectroscopic scales of basicity and/or affinity. For each scale, the definition, the method of measurement, an exhaustive database, and a critical discussion are given. All the data have been critically examined; some have been re-measured; literature gaps have been filled by original measurements; and each scale has been made homogeneous. This collection of data will enable experimental chemists to better understand and predict the numerous chemical, physical and biological properties that depend upon Lewis basicity. Chemometricians will be able to apply their methods to the data matrices constructed from this book in order to identify the factors which influence basicity and basicity-dependent properties. In addition, measured experimental basicities and affinities are essential to computational chemists for the validation, calibration and establishment of reliable computational methods for quantifying and explaining intermolecular forces and the chemical bond. Lewis Basicity and Affinity Scales: Data and Measurement is an essential single-source desktop reference for research scientists, engineers, and students in academia, research institutes and industry, in all areas of chemistry from fundamental to applied research. Christian Laurence is Professor Emeritus of Chemistry at the University of Nantes. He was head of the laboratory of spectrochemistry of the Faculty of Sciences of Nantes for 23 years, where he published more than 140 scientific papers in the field of physical organic chemistry. Jean-François Gal is Professor Emeritus of Chemistry at the University of Nice-Sophia Antipolis. He supervised, for more than 25 years, a group working on mass spectrometry and, specifically, on ion/molecule reactions, gas-phase acidity and basicity, and metal cation reactions. 1.12 Concluding Remarks and Content of Chapters 2–7. 4 Thermodynamic and Spectroscopic Scales of Hydrogen-Bond Basicity and Affinity. 4.1 Structure of Hydrogen-Bonded Complexes. 4.2 Hydrogen-Bond Basicity Scales: Early Works. 4.3 The 4-Fluorophenol Hydrogen-Bond Basicity Scale. 4.4 Hydrogen-Bond Affinity Scales: Early Studies. 4.5 The 4-Fluorophenol Affinity Scale. 4.6 Comparison of 4-Fluorophenol Affinity and Basicity Scales. 5 Thermodynamic and Spectroscopic Scales of Halogen-Bond Basicity and Affinity. 5.1 Structure of Halogen-Bonded Complexes. 5.3 Is the Diiodine Basicity Scale a General Halogen-Bond Basicity Scale?. 6 Gas-Phase Cation Affinity and Basicity Scales. 6.3 Experimental Techniques for Measuring Gas-Phase Cation Affinities and Basicities. 6.6 Significance and Comparison of Gas-Phase Cation Scales. 7.3 Determination by FTIR Spectrometry of the Complexation Constants of 4-Fluorophenol with Isopropyl Methyl Ketone and Progesterone. 7.4 Determination by FTIR Spectrometry of the Complexation Enthalpy and Entropy of 4-Fluorophenol with Cyclopropylamine. 7.5 FTIR Determination of the OH Shift of Methanol Hydrogen Bonded to Pyridine, Mesitylene and N-Methylmorpholine. 7.6 Solvatochromic Shifts of 4-Nitrophenol upon Hydrogen Bonding to Nitriles. 7.11 Mass Spectrometric Determination of the Gas-Phase Lithium Cation Basicity of Dimethyl Sulfoxide and Methyl Phenyl Sulfoxide by the Kinetic Method.